Arch Painting has defied the stereotype of commercial painting contractors with our top quality services for nearly 20 years. You can expect us to be refreshingly efficient, reliable, and accommodating of your commercial exterior painting needs. When your business looks great from the outside, it makes a worthwhile impression on all who see it. Appearance matters – to existing clients as well as potential new ones – and so maintaining the look of your building goes a long way. 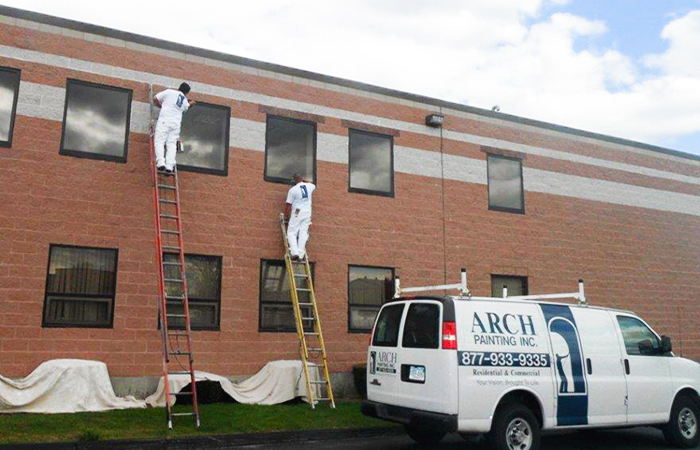 Arch Painting is New England’s commercial painter of choice, offering a full slate of services to keep up that all-important appearance, no matter what type of business you own. 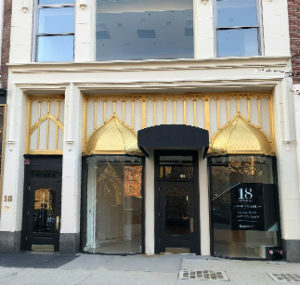 Our exterior commercial painting services span the full range from painting facades, wood trim, and the like to applying more unusual exterior coatings. For example, if you need a paint for galvanized metal on a staircase, ramp, or fire escape, Arch has the solution. We’re here for all of your condominium complex, apartment building, medical practice, general office, or restaurant painting needs. Rest assured, our staff members will be courteous and respectful to everyone they encounter on the job – you and your employees, clients, patients, and residents – plus, they will leave the site cleaner than they found it. 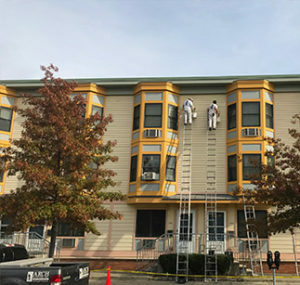 Of course, these skilled and professional exterior painters use the highest quality products and the most meticulous techniques, meaning the work will look great for years to come. Let us be the commercial painting contractor that you rely on for keeping your business looking its best. Our process for commercial exterior painting is designed to provide the most optimal results while protecting your premises for the duration of the project. Protect: Our painters cover grounds, plantings, and parked vehicles with drop cloths to shield them from paint drips and overspray. If boom lift equipment must be driven on a grassy surface, we lay down plywood to prevent tire damage. Caution tape, barriers, and wet paint signs are used as needed to direct employees and guests safely around the work site. Any lead paint chips are collected and properly disposed of. Prepare: All exterior surfaces are scraped, sanded, or chemically stripped to remove loose paint and create a smooth foundation. Rust is removed as needed, and most buildings are power-washed to eliminate dirt and mildew buildup and create better paint adhesion. Our skilled professionals also perform light carpentry repairs as needed. Apply: All joints receive siliconized caulking to prevent moisture from penetrating behind wood. To ensure good paint adhesion, rust-resistant primers and industrial finishes are applied to metal surfaces and oil primer is applied to bare wood prior to the top coat. As commercial building painters, we use a variety of techniques such as brushing, rolling, and spraying to guarantee a flawless and professional paint finish for your building’s exterior.